Psychopathic Writings: Do Psychopaths Have Self Pity? Do Psychopaths Have Self Pity? Do I feel Self Pity? I think the answer will be Yes, and No! I grew up much of the time on institutions where pedagogues were part of the staff. And one of the returning issues I had was that they always seemed to think I had a lot of self pity. I would tell them it wasn't about Self Pity, but - as I told myself at the time - about justice. The truth is it was about control, it was about me getting my way. Like most children I saw early on that displays of distress would get the attention of the adults, and their attention was required if I wanted to get what I wanted from them. Somehow a child must feel very sad in order to get what it wants. Saying: "I want that!" just didn't do it, so I would often be in a lot of pain and be very sad. But once I reached a certain age... I think about 5 or 6... and was send to correctional facilities for kids, the adults began to meet me with the same statement over and over: "You're just having self pity! Stop it!" The truth is I've never really been as reflective as to consider whether or not something is a pity for me. That is, of course I think something is a pity if it goes against my wishes or my comfort, but I've never seen much point in dwelling on it. It became quite clear very quickly that 'self pity' was bad, it was something the adults looked down upon, and soon the children did the same. To me, however, it seemed as if I couldn't stand on my rights without being accused of having self pity. Furthermore I always have had difficulties with accepting it when I didn't get my way, not least because I always thought I could give very plausible reasons for why I should be humored. - I have to say, that there were times as well, where I've no doubt in my mind that I was being mistreated, and whereas most adults reacted to my "charm" and really liked me, there would be the occasional adult who for some reason came to detest me. And when such an adult had their daily coming and going in a facility where I was an 'inmate', clashes were inevitable. Such times were the periods that I remember being accused of self pity the best. Somehow this is a very effective tool against a child who won't conform or submit to mistreatment. There were periods where I heard this on a daily basis, and I think it's helped me learn to hide my feelings even when they were appropriate. When I am in pain, and if it's strong enough... it really has to be strong in order to override my ability to assert my will and suppress a natural reaction to the pain... there have been times where I could not help but moan. To my eternal dishonest shame, I must admit this has happened to me even as an adult (dishonest because I don't feel any shame. It happened, I move on). When I was a kid and a teen, such incidents would sometimes make adults conclude I had self pity. They would tell me this, and after having it shoved in my face time after time, year after year, I finally questioned myself and considered the possibility that maybe I did really have self pity? I asked myself the question directly, which meant I had to define what self pity means first. So what does self pity mean? would be that "Yes!, I sometimes feel self pity, because I do think it's a shame and a pity that I have to go through whatever I must go through. But that isn't the correct answer, for this isn't the real definition of self pity, it isn't what people mean by the term, and it wasn't what the adults meant when they accused me of having self pity as a child or teenager. On a few occasions I actually tried saying to an adult: "Yes, I think it's too bad, it's unfortunate; it's really a pity for me!" I don't remember my words exactly though I probably didn't put it quite like that, but the meaning was the same. Whatever I said, I hardly got to speak out because they didn't accept it at all. 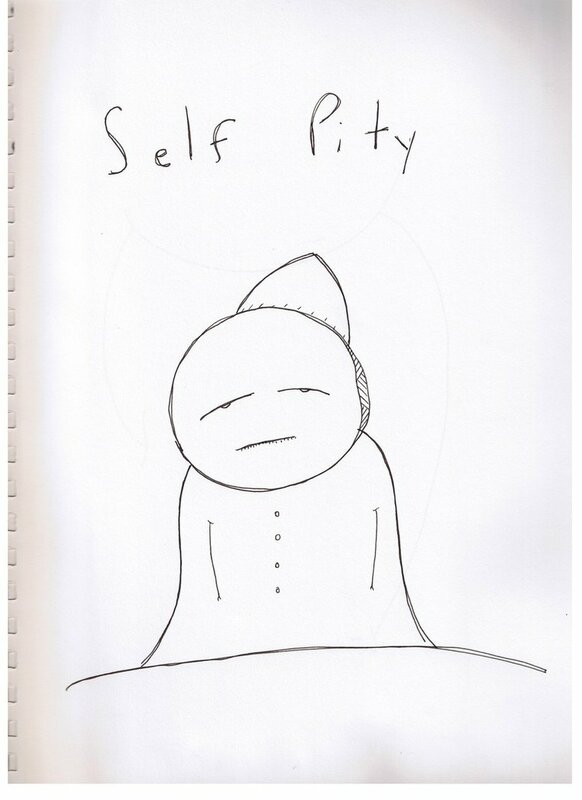 Self pity was not about thinking something is a pity. 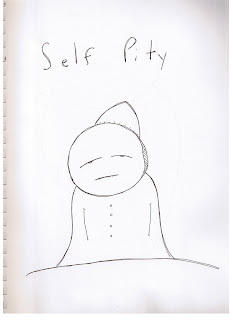 Self pity is about being in a certain emotional state for an extensive period of time. This fact used to confuse me. I couldn't understand why the other kids would remain in such a state, often even when there were no adults around who could react to it and try to make their pain go away. So what would anybody gain from being in a permanent state of thinking something is a pity? Yet I did learn something. I learned how to recognize this emotion in others, and it's very easy to spot. I also learned how compulsive most people tend to be about it, that most people - even when you make them aware of their display of a weakness they think of as shameful and despicable - will not be able to pull themselves out of it, and that gives someone like me a very easy time using it against them. So yes, I can recognize it when I see it, as I can with most emotions - even those I've never felt myself. But I still don't really understand what people gain from it... except when it is being used to impose on others to also think something is a pity and thus influence them change it for you. I also still use it myself, for as far as those I use it "against" doesn't recognize or label it as Self Pity. That's another thing: Self Pity isn't just self pity. There's a fine balance between rightful expression of distress, and shameful giving into self pity. Psychopaths are generally adept at knowing where the line is, and it differs from situation to situation and from individual to individual. Culture, local traditions, and family habits play a role too. For a while as a kid I was confused about the meaning of self pity and found it odd that the adults, many of whom didn't know each other, would keep making this assumption about me, even as I told them how it really was. Now, of course, I'm fully aware of the fact that they simply were unable to tell that I really did not encompass this emotion, just like they were unable to tell the same thing with so many other kinds of feelings. At present the problem seem to have been reversed somewhat: Now it's as if the entire world has decided that psychopaths - and therefore Zhawq - not only do not feel Empathy, Remorse, and a few other emotions, they believe we don't feel anything at all!! This is so helpful. As you describe it, having pity for myself feels the same as loving myself, and being patient with myself. It is a private matter. No one else is invited to my pity partaaaaaaaay!!!!!!!!!!!!!!!!!!!!!!!!!!!!!!!! I find at times that I am in pitiable situations, and they often throw me off or annoy/anger me. I think, what a shame that this happened/didn't happen. But I don't dwell on it, and never have. There's just too much to do to throw a pity party for very long. ooooooooooo, I have a good oul little party fer meeself now an then. T'isn't a lahng one mind ya. 'Tis shart n sweet. knowhat ahm sayin' lad.. Being depressed and feeling powerless is also the same as self pity. How's that workin for ya,lucky charm? Feck urself, hoore anon. But ya do have a point. I'll not gwan doin the self pity, I'll only need to be told how me life should have been,so I can imagine it, and color in the lines wit me imagination. How long that'l take an if it's the best road (to find the road Im supposeta be on.. -I'll not know till my brain settles, ya know) But I need ta be havin me scotch nown then with me mates n see wher that road'l take me. Lost meeself with no bread crumbs a wee while back, bu...*yawn* somebody wake me when they're arrived. Self-pity's an interesting one to talk about... because I think there's a socially acceptable level of self-pity, and a level that (as you observed) is no longer socially acceptable, but some people feel it anyway. The reason some levels of self-pity aren't acceptable to other people is because -- again, as you observed -- it can be used to get attention, sympathy, validation, or even get people to do things for you. I'd say that it's probably the manipulation form of choice for empaths... my hypothesis being that it's easier for neurotypical people to lie to themselves about it (and thus not feel guilty) than about something like bald-faced lying. Furthermore, the mechanism for it working is to get people to "feel bad." Thus, it's something that people recognize and resent. Just as it may make the self-pity-er feel in control, it makes the self-pity-ee feel not in control. That's why, IMO, it gets a negative reaction. I agree that what people mean by "self-pity" has little to do with the actual definition. I think everyone feels a little bit sorry for themselves sometimes or that they are in a pitiable situation. (I mean, it's only logical -- everyone is in an unfortunate situation sometimes!) There's even a level of "indulging in self-pity" that's considered acceptable, particularly if the self-piti-er does not use it to get others' attention. Then there are people who indulge in a lot of self-pity even when they are by themselves, in which case it's acceptable but only because it is hidden. It is rather strange, that people would be described to "indulge" in a negative emotion like that... but it is because it does, on some level, make a person feel better. Personally... I can't explain that, yet (being an empath) I've experienced that desire to indulge. But I don't let myself, because overall it would be bad and unpleasant for me to do so.